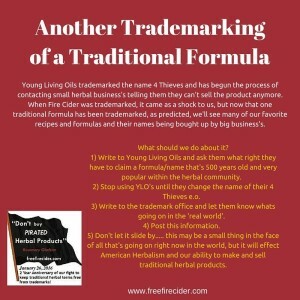 Thank you for your comments and feedback and sharing our recent post about the trademarking of 4 Thieves/ Thieves Oil by Young Living Oils (YLO). I wanted to write to you all to give you more information. Our notice yesterday on the Sage Mountain Facebook page was to inform others that another very popular, and in this case ‘ancient’ herbal name has been trademarked. Unfortunately, this is exactly what we’ve been concerned would happen. Once a popular herbal product name is trademarked, concerns are raised that many of our most popular herbal products could be trademarked by companies and corporations. We can do something about this; it just takes effort and dedication and your willingness to stand up for our herbal traditions. 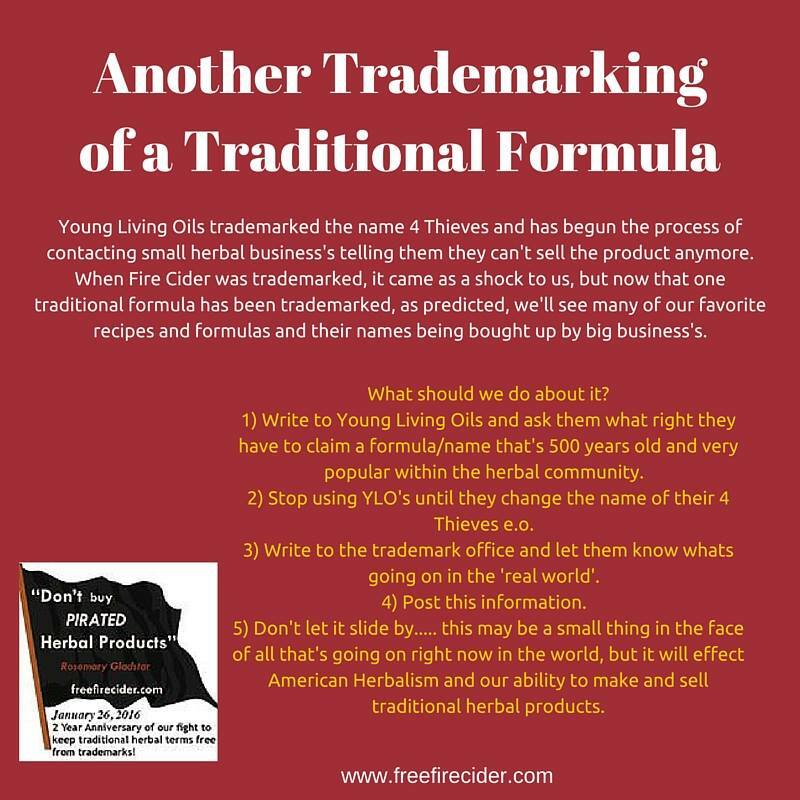 If we allow the trademarking of 4 Thieves/ Thieves Oil and Fire Cider, every other commonly used herbal product will be up for grabs. The vital thriving small herbal business community that has grown up in the last 4 decades will not be the same; popular herbal products that we’ve sold freely, will no longer be available for us to sell. We had heard that YLO’s had been granted the trademark on Thieves Oil, but had not heard of them enforcing their trademark on small herbal companies. Our posting came after we received information about a small herbal company being contacted about trademark infringement. Ruthie Hayes, an herbalist who sells 4 Thieves Vinegar on Etsy had received a notice of trademark infringement from Young Living Essential Oils, LC alleging that “certain material on Etsy is not authorized.” Etsy, in accordance with their Intellectual Property Policy deactivated the 4 Thieves listing specified as infringing. Yes, its true that YLO’s product is an essential oil, and Ruthie’s herbal product is a vinegar, but YLO’s now owns the name which means that they are the only company allowed to sell 4 Thieves/ Thieves Oil. What makes this situation particularly disturbing is that YLO trademarked the name, apparently without anyone in the herbal world aware of it, and now own the rights to a name that is several centuries old. This is the very same thing that happened with Fire Cider. No one was notified until after the public opposition period (that allows people to object) so no one had the opportunity to voice opposition to the trademark. Unfortunately for Ruthie this is the second notification she’s received; the first was from Shire City for selling her wonderful product called ‘Fuego Cider’, which Shire City objected to (never mind that she was selling her product first)! Ruthie comments, “This is the second time that a big company has picked on me about my products. The first being Shire City, for using the tag “fire cider” in my ‘FUEGO CIDER’ product listing. I am so saddened and discouraged because it so blatantly goes against the true spirit of herbalism that we strive to uphold.” Ironically enough, Ruthie is our 2015 ‘Fire Cider Fairy Queen’; she won the award for the best Fire Cider at the International Herb Symposium in 2015! 1) Voice your opposition. Continue to contact Shire City and Young Living Oils letting them know you object to the trademarking of traditional herbal names. 2) Continue to talk to the stores asking them to support the traditional herbal community that has brought the voice of herbalism to the American people. Our objection isn’t about the companies that produce these products or the products themselves, but to the trademarking of names and recipes that have been long considered commonly owned, shared freely, and passed down through the ages. These are our legacy herbal products and need to be maintained for everyone to be able to make and sell as they please. As always, please be polite and courteous! 3) Boycott! Many people in the herbal community feel boycotting is too strong a stance, but refusing to place your money where your values aren’t met is one of the best ways of making your intentions real. Boycott the stores and boycott the product; and let the store owners and buyers know why. The company may be a good company run by wonderful people, but nonetheless, they are trademarking products that don’t belong to them, regardless of the amount of money they paid for them. They belong to all of us! I accidentally came upon Rosemary’s name as I was reading about fire cider, which is new to me. I am aware of ‘Thieves’ and thought Young Living had crafted the combination. Of course I do not condone this at all. But my reason for writing here is my excitement to find Rosemary ! I was one of her students at the California School of Herbal studies in Sebastopol way back, late 70ies ? Rosemary made a lasting impression on my life, I treasure the memories of that time. I was one of three petty ‘straight women’ in the group of what we back then called hippies. What a wonderful time ! Please extend my loving wishes to Rosemary. I am still using and growing herbs in my garden. Hi Rosemary, I heard you speak at the Florida conference & am the former owner of Dandelion Cafe, which I know you have dined at. A fan of your work & legacy. Thanks for all that you do! There are public domain laws in place to protect things from trademark that belong to the “commons”, but someone actually has to file suit and perhaps this could be the work done through one of your non-profits on behalf of herbalist everywhere. Also, there is a separate legal designation under creative commons that legally preserves the rights by one body for public domain. (https://creativecommons.org/) This may be a good option through the nonprofit to preserve add’l names/recipes for public domain and your non-profits would probably have a good authority to do so. It could also be a great way to build bridges with the likely super ignorant folks who went and trademarked these in the first place. They could electively get a creative commons license and give up their trademark as a sign of atonement and to show that they realize what they did was wrong in hindsite. This trademark to me is preposterous! How can the government grant a stake of intellectual property to someone when the intellectual property has existed for hundreds of years?? This is illegal, plain and simple. The people in the trademark office did not do their jobs properly. How this trademark has existed since 2002 is beyond my comprehension. Recently, Young Living served my etsy shop with an infringement allegation. Best believe I am looking into every option to legally free this unrighteous trademark. We were hit with one from Young Living also, and my research says they own the name THIEVES but Young Living does not want us to us even the word robbers in our title for it creates, “Confusion.” If I am correct they cannot do this. THIEVES cannot be used but any other variation is okay. Is that correct? And what did you end up doing? I just received a notice of infringement as well from Young Living for Thieves Oil. Has anyone had any success in fighting these people? I was served notice that my Thieves full Armor was unlisted due to YL copyright. I am livid, as I’ve been making this ancient traditional blend for 25 years. YL is pulling a ridiculous stunt, and I only hope that MLM people WAKE UP and smell the coffee…THIS is where your higher cost MLM dollars are going…into making a strong-arm big company, NOT higher quality products, as several of YL EO’s have been found to be adulterated. Ridiculous arrogance to take something centuries old and make it “yours”. I make essential oil blends, and sell them on etsy. I have one called “KidThieves” (all one word), and I have gotten my listing taken down and gotten a letter about how Young Living owns the word “thieves” THREE times. I mean really? I am a small business just trying to make a living and you are going to pick on a word that isn’t even your trademark? Sure, it is somewhat similar, but the simple fact that they own the word thieves is a whole issue in and of its self, but I can’t even seem to use any form of that word. Same, I had a blend called Thief’s (albeit closer than KidsThieves) and it’a been removed. It feels frustrating to have to remove a product due to a complaint without even being able to defend it. Now ipdocket@youngliving.com won’t respond to my emails I’m sending to ask what I can do to make my listing more fair for both sides. Completely frustrating. It’s like trademarking “Banana Bread”. Has anyone here made any headway contacting ipdocket@youngliving.com? I’m sure we can find a way to fix this! They are responding to me but saying words like “Robbers and thief’s cause confusion.” But they only trademarked “Thieves,” not the other words. Your thoughts? Hi, Dedrianne, thanks so much for contacting us. So sorry you were contacted by Young Living. While the trademarking Fire Cider caught us off guard and was a bit crazy, the trademarking of a popular 500 year old product is truly insane and so wrong. Thanks for standing up for your product. Oil so that might have some bearing if you’re using the name robber in place of thieves. It would be good to check with a trademark lawyer on these issues. I’ve personal met & interviewed them. They have won against monster energy drink. Good people who want to change the system. When the Free Fire Cider movement started (in 2014? ), I did a quick check of the USPTO for other traditional herbal names. At the time, the YL trademark of “Thieves” had actually expired. I just saw the above post today, checked the USPTO database and saw that they had requested a re-issuance of the trademark (and obtained it) in mid 2015, just after the whole cease-and-desist action from Shire City started to become more public. has anyone who emailed Young Living actually ever heard back? I tried emailing and posting on their facebook page (a post that never actually appeared. surprise) and have not heard back. I didn’t attack, I just asked for more information on why they chose this course of action. I sincerely want to have a real conversation with someone at YL about this.